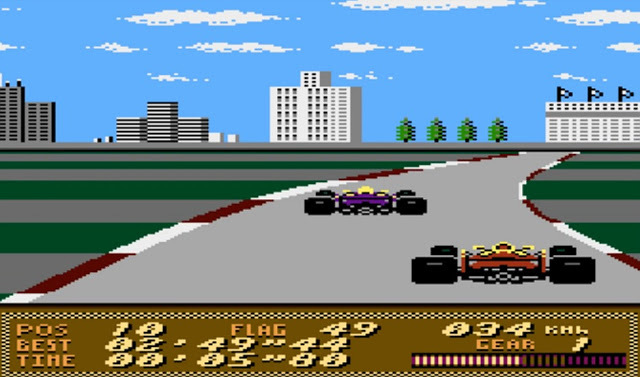 Thanks to another heads up from Zbigniew “Saberman” Zieliński, we once again look towards the Atari XL/XE scene as a little while back there was another preview update of a rather fun racing game titled as Ferrari Grand Prix Challenge (Preview 6). Yes indeed a game that used to be called F-1 Hero MD which first appeared on the Sega Mega Drive and was then ported over to the NES and Gameboy, has yet again been updated to the Atari XL/XE as an early work in progress port with improvements. This classic game allowed the player to practice up to six laps or qualify for every Formula One race in a behind the car view point. Unlike the previous preview, this one is much better as the coder looks to have stopped the cars from flashing AND it now has an intro.